The Centre has made it mandatory for all existing bank account holders to provide their Aadhaar numbers to their banks by December 31, 2017. More significantly, not only Aadhaar has been mandatory for opening new accounts but also for carrying out high-value transactions. The government has said that transactions worth Rs 50,000 or more will now require Aadhaar number. This is similar to how PAN number was required for high-value transactions. But now instead of PAN, consumers will have to quote Aaadhar number. While the deadline for linking bank accounts to Aadhaar number is the end of the year, it is not yet clear since when quoting Aadhaar for transactions will become mandatory. Here is how you can link your Aadhaar number with your bank account. Click on the option of “View / Update AadhaarDetails” from the Request section of Accounts tab in inNetBanking. Enter your Aadhaar Number, and Confirm the Account Number to link it with. Your Aadhaar Number will be updated with us, within 4 working days, after verification with the Authorities. We recommend that you login again after 4 days to check your updated Aadhaar details. 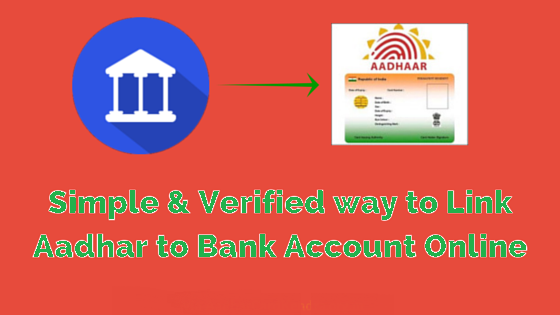 ATM - Insert Debit card >> Registration >> Enter PIN >> Link Aadhaar No. >> Select Account >> Update >> Enter Aadhaar No. >> Re-enter Aadhaar No. >> Confirm. Phone Banking Center (PBC) - Call on PBC toll-free number >> Authenticate on IVR using the Debit Card/Customer ID >> Press ‘4’ to link your Aadhaar No. >> Press ‘1’ to confirm. Branch - Fill up the Resident Consent Form to link your Axis Bank Account with your Aadhaar number, carry original Aadhaar Card & a copy. If you are an internet banking user, then you can log into www.onlinesbi.com and access the link "Link your Aadhaar number" under "My Accounts", appearing on the left panel of the screen. On clicking the above link, you will be directed to a screen where you have to select the Account number, input the Aadhaar number and click on Submit. The last 2 digits of registered mobile number (non-editable) will be displayed to the customer. Status of mapping will be advised to the Customer's registered mobile number. You can access any of our ATMs and seed your Aadhaar with your Bank account. After swiping the ATM card and entering your PIN, Select the menu "Service – Registrations"
You can now select the Account type (Savings/Checking) after which you will be asked to enter your Aadhaar number. You will be prompted to re-enter the same. If the mobile number is not registered or in case the Aadhaar is already linked to Account, an SMS reply will be sent to you. If your mobile number is registered with the Bank, you will receive an SMS confirmation of the sending request. The Aadhaar number will be verified by Bank with UIDAI. In case it fails verification, SMS will be sent to Customer to contact any SBI branch along with Aadhaar number or e-aadhaar. Customer visits any SBI branch with a copy of his/her Aadhaar number or e-aadhaar. At the branch, a Letter of Request will be obtained from the customer along with the Xerox copy of Aadhaar letter. After necessary verification, the linking will be done by the branch. An SMS will be sent to customer's registered mobile number regarding the status of seeding. I like this article. We can without much of a stretch comprehend this article in light of the fact that the writer did not utilize extreme and awful dialects and plainly indicates all the data about the topic.Some articles have not taking after the right composition arrange but rather here i got better approach for composing. I like the method for composing and the presenting.Keep sharing.I will share this article for my companions and partners.